We are Cedar Rapids (Linn, Benton, and Jones counties) best tree service since 1999. We are a customer focused tree care business where not only do the trees come first but our clients too. We are family owned and operated, having served Cedar Rapids for almost two decades now. We treat all of our customers (and prospective) customers as we would like to be treated: FAIRLY, HONESTLY, PROFESSIONALLY, and with GREAT PRICES. We are a proud community member and support our neighbors as all great Iowans do. Call us the next time you need excellent tree care at affordable prices - we always offer free estimates and can usually get to your home or business the same day you call. We are a local family owned, operated tree care company, founded in the spring of 1999. We began our company with a chainsaw out of an old Chevy pickup truck. We have grown to the company we are today through hard work, excellent customer service, and even greater Cedar Rapids customers. Our philosophy for our business has been to treat each customer fairly, with respect, and provide excellent tree care at wallet friendly prices. Below are some great reasons to call us when you need quality yet affordable tree care. We believe these reasons illustrate why we are the #1 choice for tree care in the area. Follow up customer satisfaction survey. As the area's preferred tree care company across all of Linn, Benton, and Jones counties, we are happy to travel across the area providing our great customer service focused tree care and even more pleased with the response we have gotten. We are only as good as what our customers say about us - read below for testimonial references. The next time you need tree care work done, consider the customer centric company that puts you first. Within each of these objectives is our commitment to professionalism, quality, and customer focused service. If we cannot meet or exceed each of these aims, we will not accept the work. However, it is extremely rare that we come across work where we cannot exceed these goals. In addition to the all the services listed below, please speak with one of our tree care professionals about a service you may require that we don't have listed. We can provide custom services for any unique or one off situation. 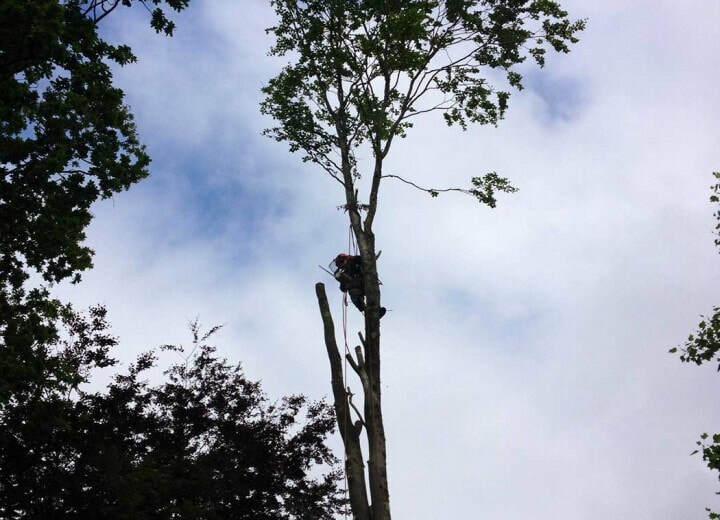 Large Tree Removal - we are experts in removing trees that have been problematic in your landscape. Reasons trees need to be removed are vary: dead or dying; creating landscape problems such as too much shade preventing grass from growing; threatening property structures, such as homes or underground pipes; and just creating a nuisance, such as leaves in gutters or overall tree debris in your yard. Regardless, Cedar Rapids Tree Service can provide professional and affordably remove any size tree in any location on your property. Professional Tree Trimming - many property owners, consider tree trimming an optional landscape maintenance task; however, tree trimming (and pruning for younger trees) should be a regular tree care job performed. Tree trimming not only maintains your trees' shape, but it promotes healthy growth by focusing energy in the branches not cut. Unlike trees in a forest, that only grow upwards as they compete for sunlight, landscape trees can generally grow in any direction, often causing them to be problematic and unshapely. Therefore, regular tree trimming is a must for any well-cared-for landscape. Stump Grinding - tree removals are almost always accompanied by our stump grinding service. Few people want a decaying, ugly stump in their yard. Further tree stumps invite pests and insects potentially making them hazardous. Operating a professional, well equipped tree contractor business is expensive. Labor costs, equipment, and insurance are all significant overhead expenses. All of our stump grinders are over $15,000 each while some of our trucks (bucket and dump) are over $30,000 each. Additionally, to protect our crew members, we carry worker's compensation, which adds on average 20% to our labor costs. So, this means for each $100 in labor cost that we incur, we incur an additional $20 - it all adds up. Now we are not complaining, but it is a fact that to provide quality tree care services a company has to incur significant expenses. To the contrary, however, we know our customer want affordable tree care. We can keep our prices down through the quality volume of business that we perform. While we may not be the cheapest tree contractor in the area, we do offer the best value when you take into consideration our quality. This best value pricing is our response to customers wanting affordable but professional services. The adage of "you can't have your cake and eat it too" is true in most things as well as the tree business. But we strive to come close in offering the best value in providing the quality tree care you expect and deserve. 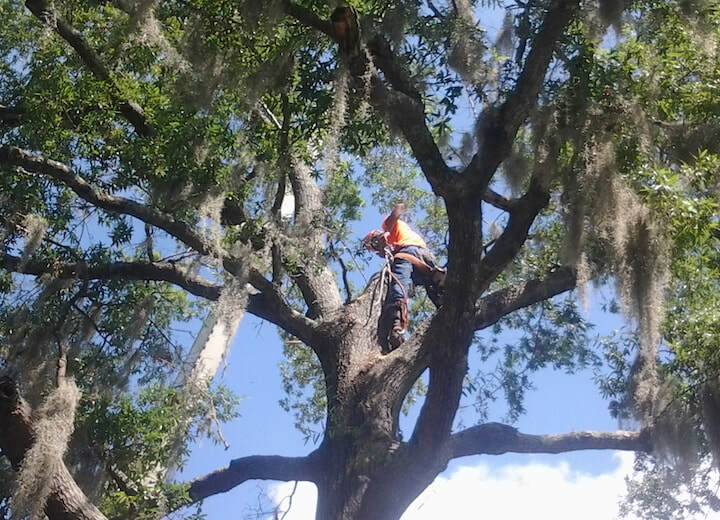 Tree work is one of the most dangerous jobs in the country, both from our crew members as well as potentially to your property. For this reason, it is paramount only ever to use a tree business that is fully insured, both worker's compensation and an umbrella liability policy with a minimum of $1M in coverage. Some tree service companies neither provide this protection to their employees nor their customers. As a result, these businesses put their employees at risk from a safety perspective, and they expose their customers to financial and legal risk. If an accident should happen on your property, and the contractor is not adequately insured, you will be liable under your homeowners policy. This scenario is not a risk property owners want to assume, especially unknowingly. It is for these reasons that we offer complete and extensive insurance protection for every one of our employees and customers. We know when you call a tree business for an estimate you ideally desire the following: 1) to speak with a real person and not have to leave a message; and 2) a quick estimate, preferably the same day as you call. We strive to meet both of these desires by our prospective customers. And in doing so, this begins our customer service excellence. We do everything we can to answer the phone every time you call; and, we strive to get out to your property ASAP, ideally the same day as you request. We know from experience that in doing these two things, we will immediately differentiate ourselves and start our relationship with you off to a great start. We make it our #1 priority to do these things each, and every time a prospective customer calls - provide excellent customer service right from the start. Search the internet to discover what people are saying about our company. We trust you will find genuine, honest testimonials of our customer service, quality tree care service, and overall business practices that sing praises about us. We have some of the best customers any business could desire; and, to our good fortune, they aren't shy about letting others in the community know. So check us out for yourself, and use the following testimonials are evidence we are the company Cedar Rapids calls when they want the best. Cedar Rapids Tree Service did a great job in removing two large Elm trees that were creating too much shade. They showed up on time, were professional, and did great work. - Jayson W.
A bad storm recently split a tree in my front yard. The guys are Cedar Rapids Tree came out only an hour after I called, and they had it cleaned up the same day. I would recommend them. - Ellen T.
My trees were very overgrown and needed trimming. They did a great job in removing all the dead branches and reshaped the tree perfectly. Thank you very much. - Aubrey S.
Strong storms with damaging wind and ice can make a mess of trees, especially mature ones. Further, the weight of heavy wet snow and ice can also cause significant issues for your trees. These conditions can often split, uproot, break branches, and even fall a tree altogether. And sometimes, this tree damage can cause other property damage, to include electrical power outages. Storm tree damage work is generally no DIY project for the average homeowner. The scale of the work and equipment usually required almost always exceed a property owner's ability. Save yourself the money, time and potential safety risk by calling the professionals at Cedar Rapids Tree. We can be at your home or business ASAP to provide tree damage clean up; and, we operate 24x7 during large scale storm aftermaths due to the volume of customers requiring relief. As a real professional services company, we understand what it takes to perform as one. We have invested in qualified staff, equipment, and insurance to provide professional services, and at affordable rates our customers expect. 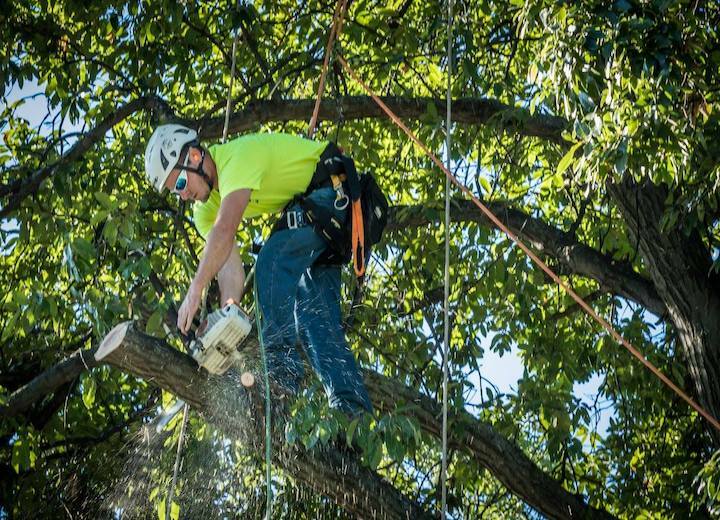 Additionally, we have also invested in our business through our certifications and other credentials making us one of the few tree contractors in the area qualified to provide complete tree care services. Lastly, we operate our business like any professional services company, to include law firms, CPA practices, and physician groups. We take our business and customers (and their trees) very seriously. We are locally owned and operated a business here in Cedar Rapids, IA. We are not a franchise business like the big national companies, such as Monster, Asplundh, and Davey. We run our business independent of a far off corporate office, and as a result, can provide affordable rates as well as differentiated services. Additionally, we are committed to the Cedar Rapids communities that we serve by investing back with charitable acts of money and time. As the tree care Cedar Rapids trust, we sponsor a variety of charity events throughout the year and offer mentorship opportunities for people interested in the business of tree care. If you do not call us for your next tree care requirement, please consider using a locally owned and operated company.